Tyron Woodley on future in UFC: "Take out top welterweight contenders, retire as middleweight champion"
Tyron Woodley is a one of the representatives of the new era of UFC fighters, a man who basically came from obscurity and rose to the very top of the UFC ranks. Long before achieving his dream in becoming the UFC welterweight champion, Woodley had taken a journey full of twists and turns, but when you actually sit down an think about it, it’s more of him being at the right place at the right time and always staying ready. A major testament to this is when he took the opportunity to take a fight with then top welterweight contender Carlos Condit in which Woodley took advantage of and got himself an important victory. And with that win lead to a shot at the UFC welterweight title match against “Ruthless” Robbie Lawler which say Woodley be the first man to ever kncokout Lawler in the UFC at a time where it seemed Lawler couldn’t be finished. Now here we are present day with Woodley the reigning welterweight champion, and he has managed to keep that reputation up of doing the impossible when it doesn’t seem possible. Though he’s been sidelined with injury as of late, his body of work inside the octagon as champion cannot be denied, racking up victories over Demian Maia, and Stephen “Wonderboy” Thompson twice. While a couple of those victories were lackluster,Woodley still found a way to retain his championship, and in this sport that’s what counts when all is said an done. With a return to the octagon inching closer, “The Chosen One” plans to continue where he left off as well complete other loft goals he’s set for himself as a UFC fighter. The 1st thing on his list, getting prepared to face the winner if this Saturday night’s UFC 225 co-main event for the UFC Interim Welterweight Championship between Colby Covington-Rafael Dos Anjos. That being said, in Woodley’s estimation, it doesn’t matter who the next challenger is, only thing that matters is he’ll be ready for whoever as he confidently stated to MMA Junkie. “I’m not really concerned with who’s ready, who’s next,” Woodley said. He continued by making his intentions loud and clear, claiming he was gonna clean out the rest of the division in beat the rest of the most dangerous contenders in his division, then make a jump to Middleweight, capture the belt, then call it a career. 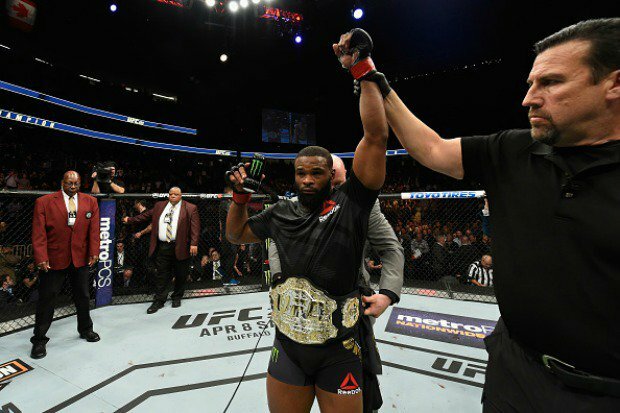 Do you believe Tyron Woodley will achieve these goals for is future in the UFC?